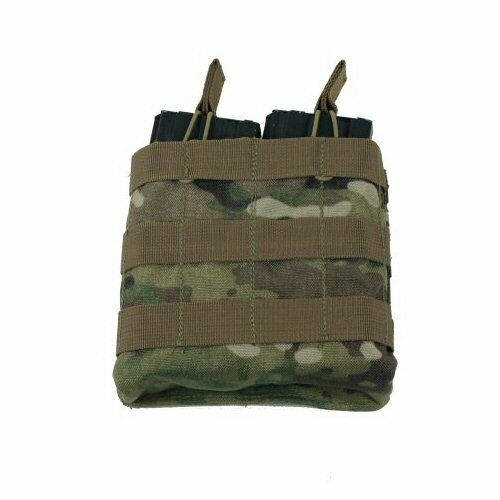 The Crye Multicam Bulle MOLLE shingle or open Quad Pouch is a four magazine carrying version of the best selling Bulle MOLLE 5.56 D Mag Pouch. 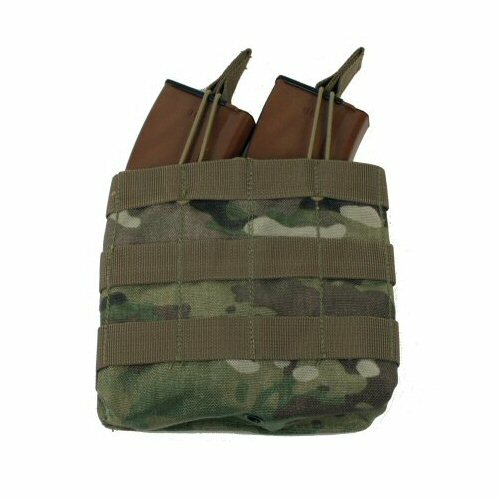 Designed to be able to carry up to two M4 or one AK magazines in each pocket, the pouch is open at the top, secured with elastic shock cords with 25mm webbing tabs for easy drawing of magazines. The pockets are positioned side by side, enabling the pouch to carry four magazines in total. 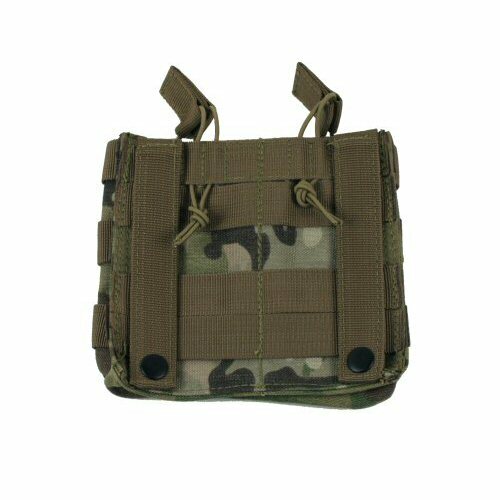 The pouch dimensions are 145mm tall, 155mm wide and 40mm deep, which gives the pouch a low profile in relation to its carrying capacity with a medium space requirement on the MOLLE base. The open nature of the pouch makes it ideal for wearing on light rigs, chest rigs and the front section of the armour carrier for rapid ammo access. The elastic shock cords help to retain the contents and are adjustable for height by tying off the cords higher or lower as required. The pouch is fitted with MOLLE webbing across the front and sides to enable another layer of pouches to stack over the pouch if necessary. The pouch is made from genuine Crye Multicam military grade 1000D Cordura nylon and Cordura webbing. 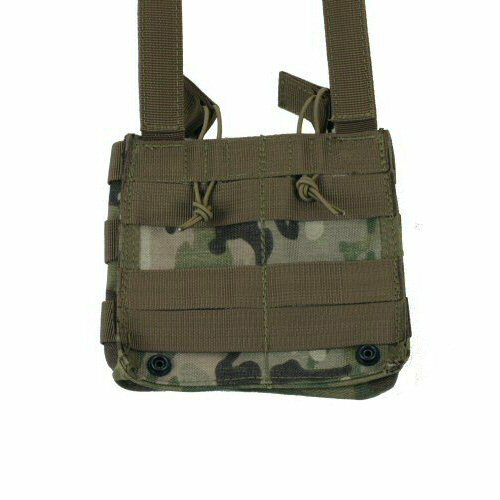 The rear of the pouch is fitted with 2 MOLLE vertical straps and additional MOLLE horizontal straps for interweaving onto the MOLLE base. The vertical straps are finished with press studs to the body of the pouch on the rear. Please note that price is for ONE pouch only. Accessories are shown for illustration purposes only and are not included. View of rear of pouch showing the rear MOLLE webbing, showing the shock cord adjustment and MOLLE fixing straps. View of the rear of the pouch showing the fixing straps raised and the push buttons at the bottom of the pouch. View of the pouch holding two AK magazines. The shock cord does not need to be lengthened.